Product prices and availability are accurate as of 2019-04-16 15:38:42 EDT and are subject to change. Any price and availability information displayed on http://www.amazon.com/ at the time of purchase will apply to the purchase of this product. 1-Device Universal Remote Control for TV only. 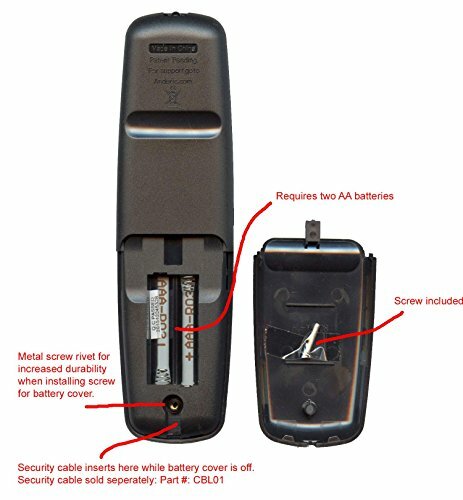 Basic-function remote features a limited selection of over-sized buttons, perfect for situations requiring simplified control of a television only. By removing buttons like the MENU button and all other functions for the DVD players, cable or satellite boxes, standard functions are much easier to access. With added security by attaching the optional cable attachment; rest assured, your investments are protected. Perfect for televisions located in public areas, or in environments where the sets are operated by children or elderly. Preprogrammed to work LG and Vizio TVs. As well as STB-2000 Set-top Boxes (Bed code 0). Features: Designed specifically for Hospitality No Menu button Super sized buttons with Glow Channel and Volume keys Works with all HDTVs and Older TVs as well Easy 2 step programming Includes features for "Dash, Sleep, Closed Captioning and Previous Channel" Includes full operating manual with extensive code database Includes screw for battery cover to keep guests out Easily removable battery cover and does not need to be screwed down to keep in place Entering "Setup" mode requires the press of two buttons simultaneously; this keeps guests from accidentally de-programming the remote Optional security cable attachment available (CBL01). Dimensions: 7" x 2" x 1"